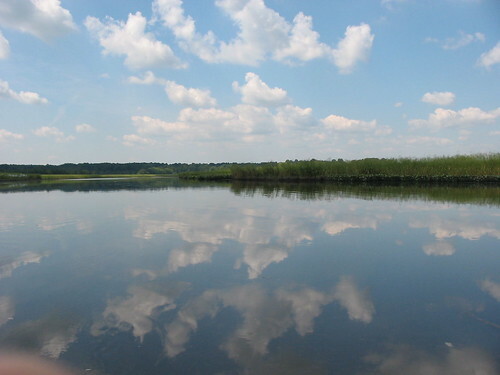 The Patuxent River flows 110 miles from Parrs Ridge in Carroll County, all the way to the Chesapeake Bay. In 1968, it was designated one of Maryland's scenic rivers. And, in response to that designation, more than 6,000 acres of land are protected around the river. 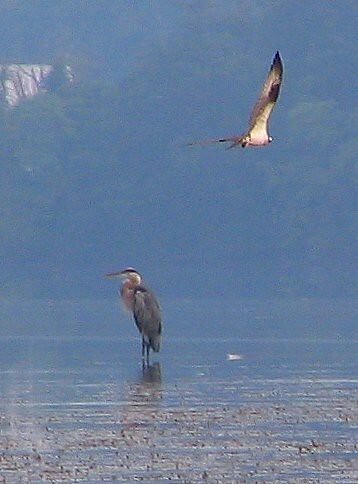 Jug Bay Natural Area is the headquarters of them all. In its 2,000 acres there are more than eight miles of trails, and there's more to explore on the water. With a moderately short drive from DC (15 miles from the beltway), you'll be a world away. This part of the river is a tidal estuary. The water level rises and falls with the tide, and the flow of the river can slow or even reverse when the tide is coming in. These conditions attract a unique combination of plants and animals, and they're thriving in this protected area. More than 250 species of birds have been reported here; you're almost guaranteed to see ospreys, ducks, herons, cormorants, and red-winged blackbirds, and we often see bald eagles. The marshes have extensive swaths of wild rice, pickerel weed, and spatterdock. 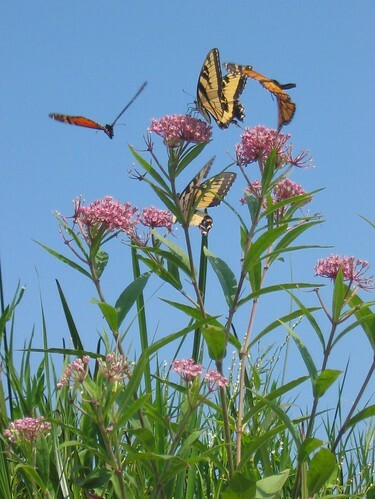 In the summer, joe pye weed, swamp milkweed, and ironweed attract lots of butterflies along the sides of the river. We've come across beavers and muskrats, and been delighted by many jumping fish. 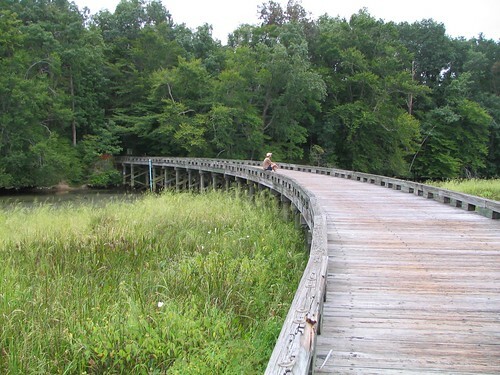 Whether you get there by land or by water, we recommend a trip down to Mattaponi Creek, at the south end of the park. There, you'll find a small tower for wildlife observation, and a 1000-foot-long wooden bridge that goes through a marsh habitat. Six days a week, this area is closed to cars, but open to foot and bike traffic. On Sundays you can drive across the bridge and into Merkle Wildlife Sanctuary, on what is called the Chesapeake Bay Critical Area Tour. Hiking, biking, and horses: People, mountain bikes, and horses are all allowed on the trails in this park. Stop in the park office to get a map. MAMBO has this description: "The trails on the right (west side of the park) are mostly easy, wide lanes; the extensive system of trails to the left are more technical single-track.The trails range from wide, grassy wood lanes to twisting single-track trails littered with downed tree limbs and roots. The trails occasionally plunge into narrow creek valleys, cross wooden footbridges, and then ascend on short, steep climbs. The high clay content in the soil holds water and the paths are often wet long after it rains." 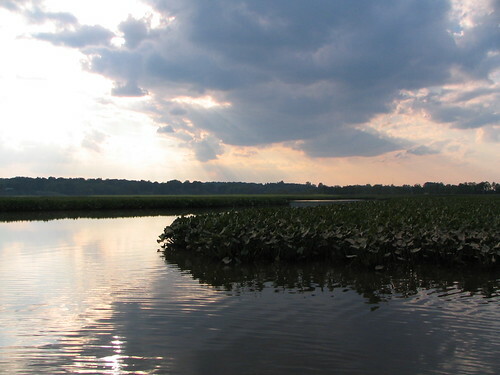 Boating: The park has two boat ramps (Jackson Landing and Selby Landing), and offers canoe and kayak rentals for the extremely reasonable rate of $15/day ($12 for PG County residents). Reservations are required - call the park office at 301-627-6074. Be sure to look at the tide tables when you're planning your trip. It's much more fun if you're working with the tide. Boats with trailers are also allowed with a fee. Camping: There are two group campsites in the park, but you have to reserve them far in advance (or go mid-week). Call the park for more information. Fishing and Hunting: Fishing is permitted with a license. Waterfowl hunting is also permitted in the park; a limited number of blind sites are leased on a seasonal basis. Dogs: Allowed in the park, but supposed to remain on leash at all times.